Unsubtle...A disappointment for adults, [but] still qualifies as a peppy object lesson for would-be overachievers. 115 min. Walt Disney Pictures. Director: Bill Paxton. 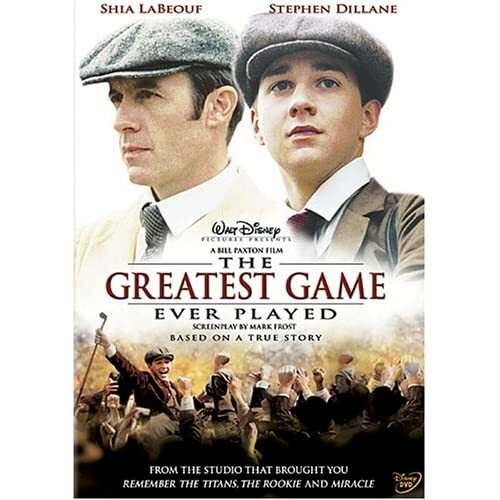 Cast: Shia LaBeouf, Michael Weaver, Elias Koteas, Stephen Dillane, Peter Firth. The movie I watched in my head while reading Mark Frost's surprisingly engaging non-fiction book The Greatest Game Ever Played hasn't quite made it to the screen, but give credit to screenwriter Frost and director Bill Paxton for the attempt. Since Disney produces enough true-sports movies now to open a boutique division, this tale of an underdog's trip to the U.S. Open in the early years of golf was inevitable, especially in its echoes of modern prodigy Tiger Woods. 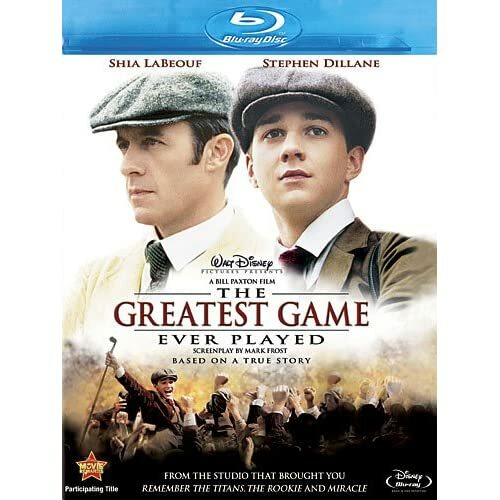 Shia LaBeouf plays Francis Ouimet, the 20-year-old amateur who wound up, in the 1913 Open, neck and neck with reigning champion Harry Vardon (Stephen Dillane of The Hours). Both Ouimet and Vardon rose from humble roots to legendary heights and, in the process, witnessed and influenced the changing face of golf. Unfortunately, Frost and Paxton fail to strike a narrative balance between the mirrored characters. Worse, Paxton's stylistic choices—so sure-handed in his directorial debut, Frailty—go frequently over-the-top here (beware the psychedelic period credits). Frost literalizes for the screen the inner lives of the leading players: top-hatted ghosts haunt Vardon as nasty reminders of his class inferiority, and Paxton uses special-effects to demonstrate Vardon's focused visualization on the green. The script hammers repeatedly at the class issue intrinsic in the golf world then as now, with members-only insiders (led by Peter Firth's Lord Northcliffe) bellowing with evil gusto as they dismiss and underestimate the game's dedicated craftsmen. Here, Frost and Paxton seriously underestimate their audiences. Though the issue is not a trumped-up one, and the players were probably reminded of it at every turn, its expression in The Greatest Game Ever Played becomes not only dramatically redundant but painfully overstated. We get it: the gentlemen aren't gentle, and the low-class men are classy. Both Ouimet and Vardon face unsubtle rejection from golf-club membership ("Young man, you may have been invited, but don't get the idea that you belong here," says one wag to Ouimet at an Open gala). Ouimet's immigrant father compounds the problem with his cynical lack of support: "A man knows his place and keeps his piece with it." Undaunted, Ouimet and Vardon become respective national heroes (the papers dub Ouimet "AMERICA'S LAST HOPE") by tenaciously ignoring all naysayers. That such brazen sentimentality was currency in the early part of the century goes some way to excusing it here. After all, Frost has adopted a great yarn, and retained its essential heart and humor. The leads do good work, and if the half-hearted romantic subplot fizzles, a stranger-than-fiction character—Ouimet's plucky-tyke caddy Eddie Lowery (Josh Flitter)—saves the final-act golf showdown from boredom. A disappointment for adults, The Greatest Game Ever Played still qualifies as a peppy object lesson for would-be overachievers. In its Blu-ray debut, The Greatest Game Ever Played gets a very handsome hi-def transfer. The rich period color scheme is accurately conveyed, with deep blacks and sharp detail (so sharp there's a hint of edge enhancement at times). The DTS-HD Master Audio 5.1 sound mix convincingly puts us on the green, with full-bodied surround usage that also ably puts across music and dialogue. The DVD bonus features remain intact, starting with an audio commentary with director Bill Paxton and an audio commentary with author, screenwriter and producer Mark Frost. Both are worth a listen, but if you have to choose one, go with Frost, who—as the author of the original book and the screenplay—knows his stuff. "A View from the Gallery: On the Set of The Greatest Game Ever Played" (15:22, SD) is a traditional making-of, with behind-the-scenes footage and interviews with Paxton, Frost, producer Larry Brezner, sequence conceptual consultant Mick Reinman, Shia LaBeouf, composer & conductor Brian Tyler, production designer François Séguin, costume designer Renée April, Peter Firth, Peyton List, Stephen Marcus, Michael Weaver, CDN PGA golf trainer John Murray, visual effects supervisor Dennis Berardi, George Asprey, Stephen Dillane, and Elias Koteas. Illustrated with film clips and vintage photos, "Two Legends and the Greatest Game" (6:51, SD) is a Cliff's Notes version of Frost's book. "From Caddie to Champion: Francis Ouimet" (25:18, SD) is a 1963 WGBH special, hosted by Fred Cusick, and honoring the 50th Anniversary of Ouimet's historic U.S. Open victory. Cusick chats up Ouimet and tours the grounds of the Country Club at Brookline, Massachusetts. This lovely special edition of a lovely film is well worth a space on the ol' shelf, especially for golf nuts. All site content © 2000-2019 Peter Canavese. Page generated at 04/17/2019 10:41:28PM.